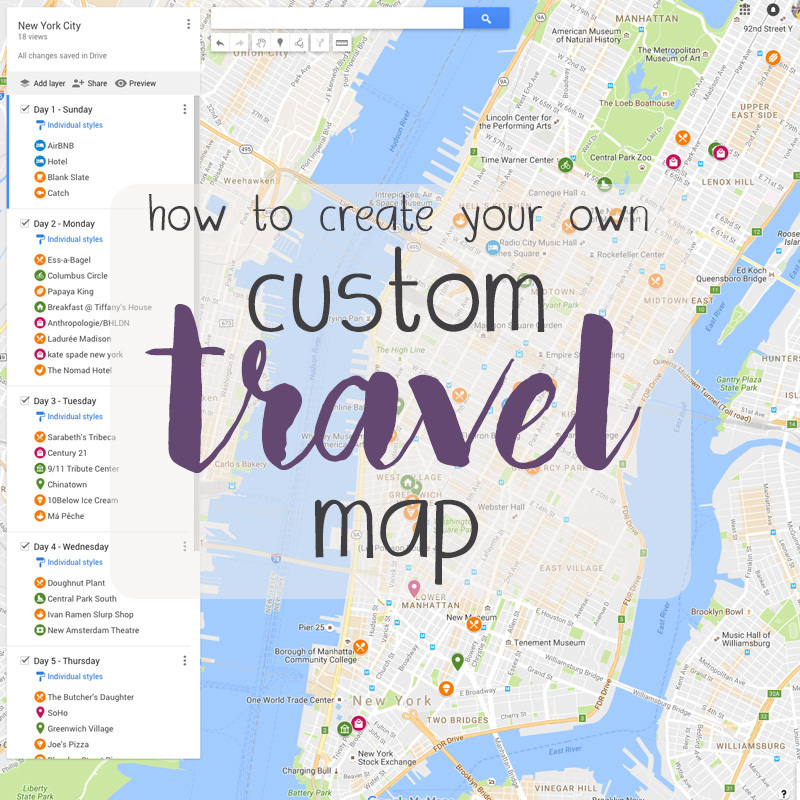 In light of our upcoming annual trip to New York City, I want to share with you THE biggest game changer when it comes to vacation planning....a custom travel map! I mentioned in this post that I am an over-planner. I like having my Google Spreadsheet itinerary in hand at all times and knowing what's next on the agenda....with backup plans in place, of course! When the bakery you originally planned on visiting for a mid-morning coffee has too long of a line, sometimes you need a good plan B! It's SO important to have an idea of where you are and what is around you at all times, just incase you need to implement or kill some time. My saving grace. 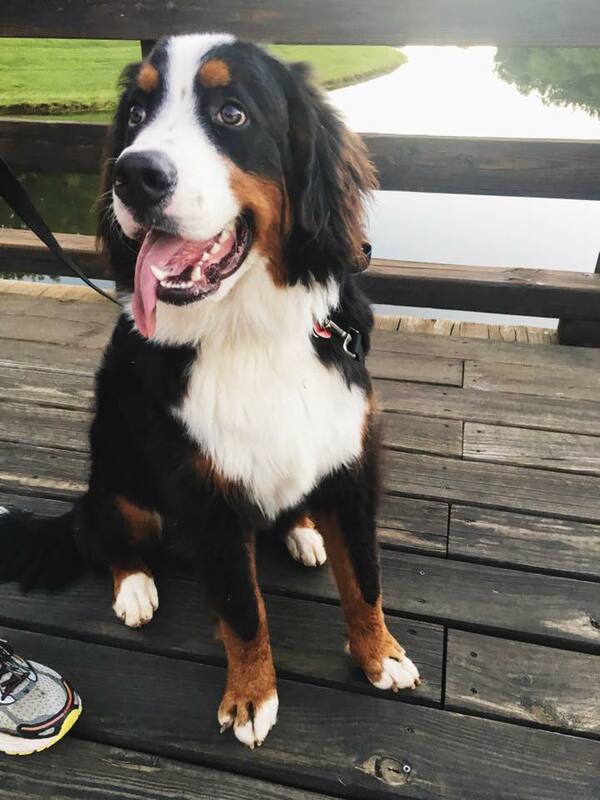 My best friend. My favorite travel buddy (sorry, Cole). I used to print out a map and draw on every restaurant, activity, etc. and list it by number according to type. It was super time consuming, very old school, messy and inconvenient. When I discovered I could make my own personalized Google map AND have access to it at all times on my phone......hallelujah, yes and amen. All the praise hands! It has made planning our NYC vacation so much simpler and I know it will make the trip itself smoother, as well. Go to www.google.com/maps/d/u/0/?pli=1 and click "Create new map." Name your map in the top left hand corner. Using the search bar, add locations. You can search by name or address! Click "+ Add to map." You can change the icon style and color to keep everything organized. You can add notes and pictures to each location to remind yourself what it is, why you chose it, or what you want to do/order. Click the "share" button underneath the map title to share your map with your travel companion so they can access/edit, too! And that's it! You can access your map through the Google Drive app on your phone. I hope this helps you as much as it has me! What are your favorite vacay planning tips? Hi, guys! It's been a hot second since my last post. Has anyone else been suffocatingly busy as of late? It seems like every weekend from now until New Years is already booked! But that's OK, it just means the holidays will get here that much quicker. Insert Santa emoji here. I am deep in the middle of wedding season....I'm a maid of honor this month, Cole is a best man in October, and my brother-in-law just got married a few weeks back! Needless to say, our life has been jam packed with wedding-related activities. But, somewhere in the midst of the craziness, Cole and I always try to find time for a night out together. I think it's so important to keep dating your spouse, even after marriage. For us, date night typically means trying a new restaurant or returning to a favorite one (because we're fat kids at heart and our lives revolve around food). Recently, one of those new restaurants became a favorite and we've been back several times since! 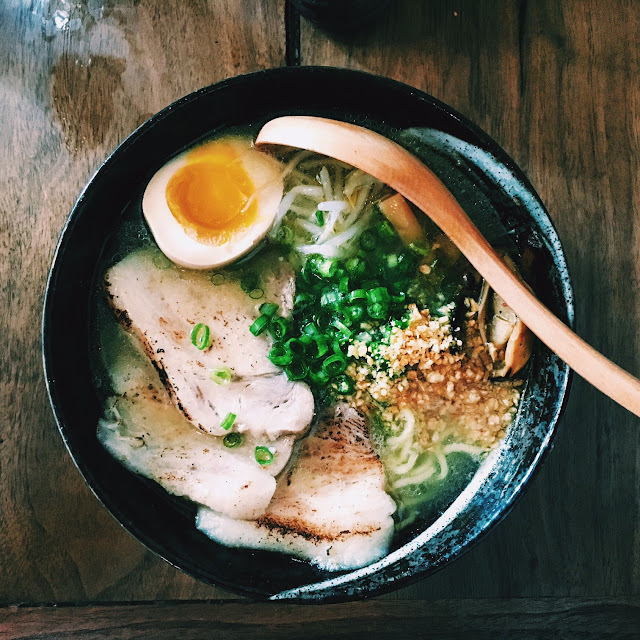 Have you been to GoRo Ramen in the Plaza, yet? If the answer is no, cancel your dinner plans and GO! Now! I like to think of myself as a ramen pro. My gourmet chef of a husband makes his own ramen broth, we've slurped the best ramen NYC has to offer and when I hear the word "ramen," the microwave version is faaaaaar from the first thing to pop into my head. All that to say, I give GoRo all the stars. GoRo offers three different types of ramen: Tori Paitan (classic chicken broth with pork belly), Yasai (tofu/vegan), and my personal favorite, Spicy Miso! With so few options to choose from, you can't go wrong. For those that don't know, ramen is a Japanese comfort soup. The broth is prepared for 12+ hours to create a silky smooth base that is incredibly rich in flavor. Then, the noodles and various meats and toppings are added. It takes some practice to eat efficiently, but I find that chop sticks and a large slurping spoon work best. Please note: I do not recommend eating ramen on a first date. The ramen itself is superb, yes, but the drinks, apps and desserts truly make the meal at GoRo complete. Dessert is my favorite food group, after all. Drinks: Pai Mei (sake, gin, matcha, honey, lavender) - you know I'm a sucker for gin and herbs. Apps: Tebasaki (chicken wings) - I day dream about eating these on the daily. No lie. Ramen: Spicy Miso (chicken broth, garlic miso, pork meatballs, corn, etc.) - the perfect combo of spice, heartiness and comfort in a bowl. Plus, the meatballs are top notch. Nom. Nom. Nommmmm. Dessert: Miso Corn Ice Cream (ice cream covered in corn flakes and blueberry compote) - yes and amen. Trust me, you will leave here fuller than full and will wish you could have eaten more. Think: Thanksgiving dinner minus the dry turkey. It's that good. GoRo chooses to #RespectTheRamen. That means they do not accept reservations or parties over 6. There is almost always a wait, so be prepared. It's 100% worth it.